Zambia is a potentially rich country, with a predominantly young population, abundant land, water and minerals. However, this country is somewhat surprisingly dangling at the bottom of the 2016 Global Hunger Index. Malnutrition has actually been a nagging challenge for the people of Zambia for quite a long time now, without much improvement. About fifteen percent of children under five are underweight, six percent are severely malnourished -a strong predictor of mortality among under-five children – and forty percent are stunted, indicating chronic malnutrition. On the other hand, twenty-three percent of women in Zambia are considered as overweight or obese, a situation which makes nutrition management highly complex. Hunger, undernourishment, and malnutrition rates for Zambia are reported in the Global Hunger Index 2016 as being extremely high and among the highest rates in the world, ranking Zambia second from the bottom. According to the National Food and Nutrition Commission (NFNC), one of the major causes of malnutrition is the mono diet practice. The Zambian diet relies heavily on nshima, a hard porridge made of maize powder. This mono diet is born from the food production, which is heavily slanted towards maize. As a result, the country’s food security faces a grave challenge. The strong focus in Zambia on growing a single crop, a practice called mono cropping, is worrying. For it is eroding ecosystems, crop diversity and regrettably reducing the diversity of foods on our plates. Zambia’s government has promoted maize more than other crops such as cassava, millet and sorghum. Since 2007, it has spent on average eighty percent of its agricultural budget supporting the production of maize and procurement of fertilizer through its Farmer Input Support Programme (FISP), and has provided price support through the Food Reserve Agency (FRA). This policy has essentially hampered progress on nutrition. It is beyond doubt that Zambia needs to shift attention away from maize to other crops. This would not only improve our diets but also ensure sustainable food production and consumption for the people, most of whom are in the agricultural sector and in rural areas. What’s more, Zambians will be offered a great opportunity to eradicate hunger, malnutrition and even poverty when the country moves its focus to diverse food production, including high-protein beans and ground nuts. 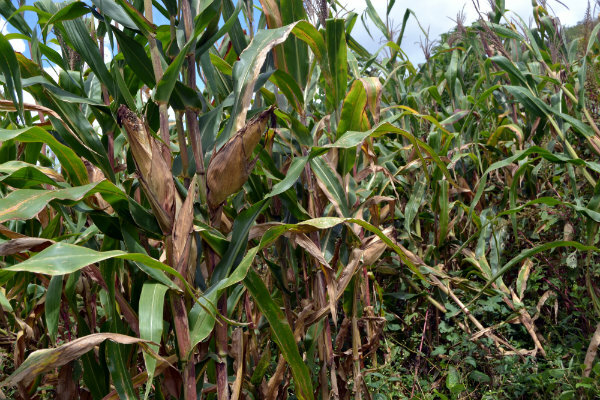 Another risk of the current excessive focus on maize in Zambia is that any occurrence of a large-scale drought would see countless Zambians go hungry, and those of them whose only business is maize production, lose revenue. In that case, there would be a huge drain on maize reserves, destabilizing further the country’s food security. Entering the path of diversification would shield Zambia from the above scenario, because people would still have food from crops such as sorghum and millet that are less vulnerable to the negative effects of climate change, such as poor of erratic rainfall and longer periods of drought. To this end, Hivos and IIED have been conducting “Food Change Labs” in various countries to support local people in their needs facing food security and food diversity. The food lab approach brings together many voices involved in influencing food policies and re-shaping the food system. During the 2015 food lab in Zambia in Chongwe District, the local people discovered a number of indigenous and non-wood forest foods in the area, such as tubers, bulbs, wild fruits, indigenous vegetables growing on cultivated lands, and others in the forest, like mushrooms. Though nutritious, these are not consumed by the majority of the population as they are considered inferior and unappealing, especially among the younger population. Hivos and IIED are collecting information on these indigenous and non-wood forest foods in the district for a book highlighting their nutritional values and benefits. The bottom line is that Zambia must invest substantially in diversifying her food production and consumption patterns to overcome development challenges such as hunger and malnutrition and to ensure good health for all her citizens.